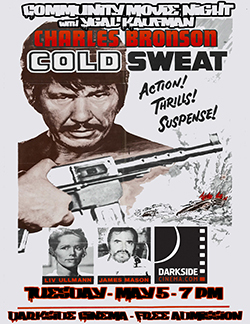 Directed by Terence Young, starring Charles Bronson, Liv Ullmann, James Mason, Jill Ireland and Jean Topart, it’s Cold Sweat, from the novel Ride the Nightmare by Richard Matheson. CMNYK is blazing new territory with our first movie from the 70s, and the territory is not the only thing blazing; the guns are too with this taut action thriller from the director of Dr. No and the star of some of the greatest action films ever, the inimitable Charles Bronson (Dirty Dozen, Magnificent Seven, The Mechanic, Death Hunt, Death Wish). This French-US co-production features three time Oscar nominee James Mason and two time nominee Ullmann as well as Bronson’s long time wife and co-star, Jill Ireland, in a car chase fueled exploration of secrets, lies and revenge. Joe Martin (Bronson) is a former drug dealer who has to confront his closet full of skeletons when one of them comes out and grabs his wife and kid. Cold Sweat also has the distinction of featuring one of Bronson’s best mustaches, in a long illustrious history of great mustache-ing. 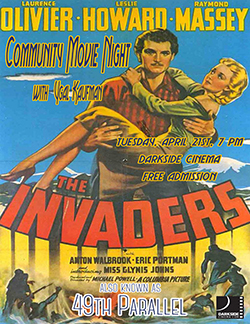 As always, admission is free and donations benefit the Darkside Cinema. Fritz Lang is easily among the greatest directors to ever do it. His genre defining films such as Metropolis (1927), Spies (1928) and M (1931) are remembered as ultra-classics, but this noir melodrama starring the legendary Edward G. Robinson also deserves to be seen. At this point in his career, Lang was churning out stylish thrillers left and right. 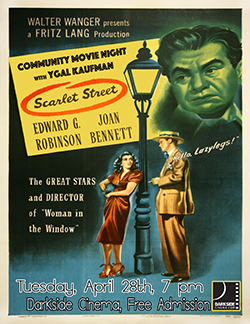 Scarlet Street was made on the heels of one of his biggest commercial successes, The Woman in the Window (1944), and reunites that film’s stars, Robinson and Joan Bennett. He plays a talented painter in a loveless marriage who meets her, an intriguing femme fatale, and wouldn’t you know it? Complications ensue. This brilliant and beautiful overlooked noir masterpiece also features Dan Duryea in a supporting role. 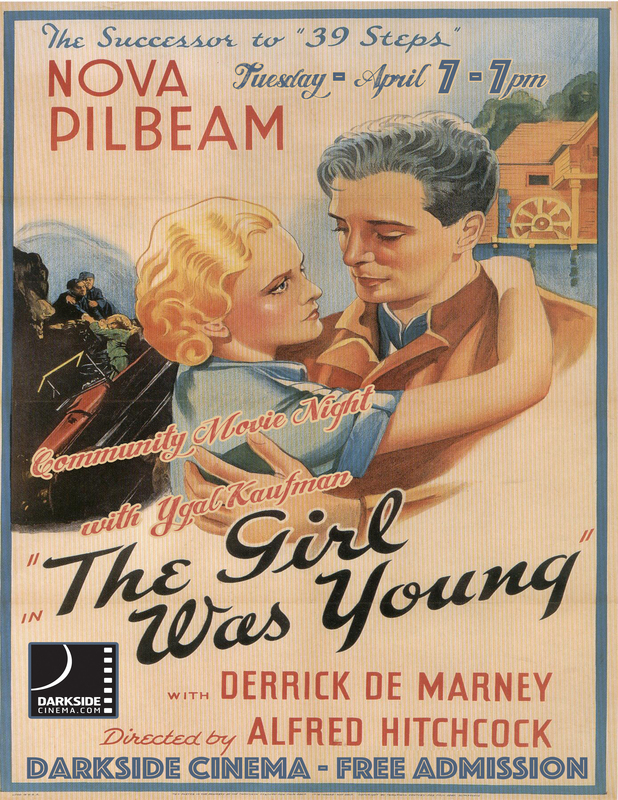 Join us for Fritz Lang and Edward G. Robinson’s second appearances at CMNYK. As always, free admission at the wonderful Darkside Cinema! How’s this for a kooky setup: a U-Boat full of Nazis gets stranded in Canada, and desperately attempts to make it to safety in the United States! When this film was released in 1941 the US was still neutral about WWII. The Brits made this propagandistic piece of film excellence to try and nudge us into the fray. Laurence Olivier, Raymond Massey, Leslie Howard, Glynis Johns and a several other screen legends appeared in this taut thriller. Michael Powell directed this film that will have you rooting for the Mounties to stop a marauding and murderous band of German soldiers desperate to make it to the safety of the United States. Olivier makes his 3rd appearance at Community Movie Night, while Leslie Howard and Raymond Massey both make their second. You should make your first appearance if you haven’t yet, at this great piece of WWII cinema history. See you all there! Preston Sturges is still revered as one of the greatest and influential writers and directors of all time. 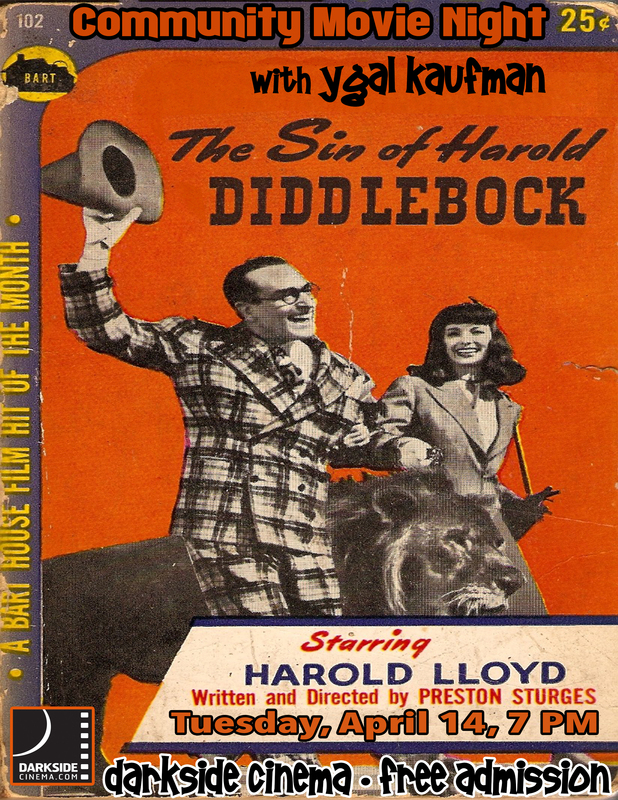 His collaboration with Howard Hughes, and retired silent film star Harold Lloyd, The Sin of Harold Diddlebock, is a true forgotten classic. It only played on screens briefly in 1947 and was a flop before it was pulled. Hughes re-edited it and released it again in 1951 as Mad Wednesday. It was a flop once again. It’s the ultimate tale of a lost night of adventure, like a post-war The Hangover with more social commentary. Harold Lloyd sends up his own great career which saw him make more movies than either Charlie Chaplin or Buster Keaton in the silent era. Join us for this brilliant lost classic, free admission at the Darkside Cinema. Directed by the master, Alfred Hitchcock, based on the novel “A Shilling for Candles” by Josephine Tey, The Girl Was Young is an oft forgotten masterpiece. Hitchcock unveiled some of the technical artistry that would become his signature in this film, including masterful crane and tracking shots whih boggled minds when the movie was released in 1937. Nova Pilbeam, who we recently saw at CMNYK in another Hitchcock classic, The Man Who Knew Too Much, stars as the heroine of this whodunit that features a plot that would become central in many of his films, a wrongfully accused man trying to clear his name. This glorious Hitchcock classic will be screened at the Darkside Cinema at 7 PM on Tuesday, April 7th. Of course there will be newsreels and cartoons from 1937 before the film starts, and you should probably arrive early as this Hitchcock guy is pretty popular.